Only one phone camera got video of the Assange arrest though 30 news agencies were present…why? In 2009, VT recognized Wikileaks, sadly, wasn’t real. We looked at their material, their Iraq leaks and discovered them to be fake. Our own people had written the real material, much of it while serving in Iraq. Wikileaks was created to launder Mossad material, a blend of as Zbigniew Brzezinski termed it, “chickenfeed and seeded material.” By “seeded, ZB meant “fake.” We traced Assange to intelligence training in Israel, tied him to Michael Oren and to a support group within secretly financed disinformation websites. The hit piece on VT here was supposedly written by Israel Shamir. WE think otherwise. Breaking News: Julian Assange a Mossad Agent. From there, we watched every leak, always chickenfeed, always attacking political or military enemies of Israel, always seeded stuff, faked. We found Assange in continual and direct contact with the Mossad, at one time openly inviting them to edit Wikileaks material at the offices of the New York Times, where a real leak was sent. Most Wikileaks came from the CIA or Mossad, stolen through the NSA through a partnership agreement with Israel. Assange supporters have been the blind, the ignorant and traitors within Russia and the US. Now we see the real theatre play out, this is going to be fun. For those who forget, the organizations that have supported and protected Assange in Britain are all controlled…openly…by the Rothschild family. Now we watch them begin their magic as the sheeple of the world cringe in terror while a little tiny gutless Mussolini enters a new phase of his service to Israel. 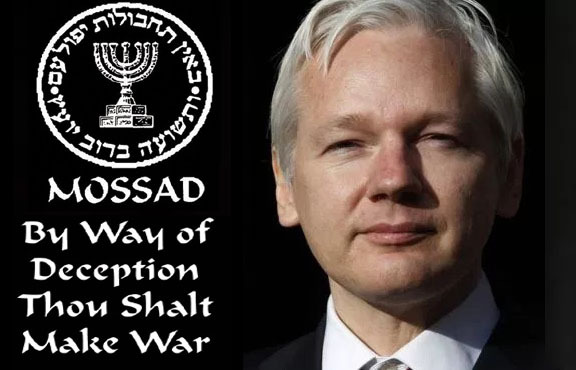 We had a strong indication this was going to happen last week as we learned that there had been a breakdown in relations between Israel and Ecuador and that Assange and Israel were about to go after new Ecuadorean President Lenin Moreno. We strongly suspect that Israel is going to use the US to take down the Latin American countries that oppose Israel’s genocide of the Palestinian people and destruction of the Palestinian state. We have already seen Brazil taken over by Israel with the recent ‘election’ (yet more Israeli ballot rigging) of far right president Jair Bolsonaro who has made little secret of his admiration for Israel and close relationship to Netanyahu. “Ecuador President Rafael Correa formally recognized Palestine as an independent state on Friday, following its neighboring countries Bolivia, Brazil, Argentina and Uruguay earlier this month, French news agency AFP reported. Trump’s recent move to cut US aid to Honduras, El Salvador and Guatemala may well have been made on behalf of Israel and intended to warn these nations not to join their neighbours in opposition to Israel.